So, here’s a brief picture tutorial on how to use liquid eyeliner easily. One certainly needs some practice and patience before mastering this art and then you can play around with the liner for the type of contouring you want! The most important point before getting started is to make sure that your hand is steady. If you have shaky hands then rest your elbow on a proper support for first few times to avoid uneven lines. Clean and prime your eyelids. Apply your eye makeup before applying the liner. Then starting from the middle of the eyelid draw a thick line towards the outer corner of your eyes keeping it close the upper lash line. Remember not to cross your line beyond the upper lash line width wise and make sure you don’t put too much pressure on it. Tip:Ensure the brush of the liner is thin. Then again from middle draw a comparatively thinner line towards the inner corner of your eye. Retouch the points where the line seems to be broken or uneven. Once done, apply a bit of concealer in the end. Complete this technique with a dusting of eye shadow. Dramatic! Pencil eyeliner is comparatively easy to apply (Refer HERE for tutorial). Apply pencil eyeliner very lightly on the lash line and then darken it with liquid liner. This is relatively easier to do as you already have a line and structure to follow. If you are uncomfortable by drawing a line from the middle of the lid, you can start from the inner corner of the eye and while coming towards the outer corner try to make the line a bit thicker. Another way to get the leanest line is by using the tip of your brush and looking up and outward in a mirror. 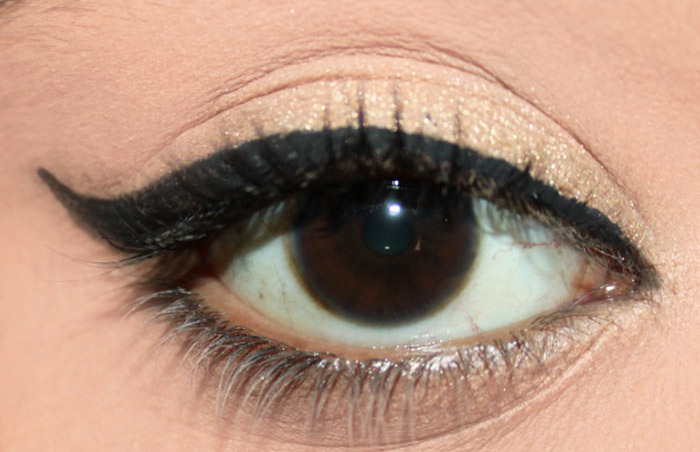 So there you have it, our beginner tutorial on how to wear liquid eyeliner. Hope these suggestions will help you to improve your lining skills. Do tell us if this tutorial has helped you in any way. Even better if you can leave us a picture! Now, what if you aren’t comfortable with the sharpness of the liner, and are looking to soften it out to suit the occasion? No worries as this makeup lesson will help you achieve a softer winged eyeliner look. Now you needn’t compromise with the winged look, yet make it look soft at the same time! Here’s our DIY makeup hack that will help you carry the beautiful classic winged eyelinershape, but with a softer finish, making it totally appropriate for daytime, college, office or just for a delicate eye makeup look. How To Soften Sharp Liquid EyelinerLook? Hydration is the basic step we need to follow before applying any kind of makeup. The same principle also applies to eye makeup! Gently pat your favorite under-eye cream to moisturize the delicate area and to relieve the dryness. Even a little dryness can make your makeup appear unattractive. Start by applying and blending it gently with your ring finger till it blends into the skin. People with darker and pigmented eyelids can use salmon or orange color corrector before applying the concealer. Doing this will hide the dark circles, and also create an even base for the eye makeup. Finally, set it with a compact powder to stop creasing of the products applied. 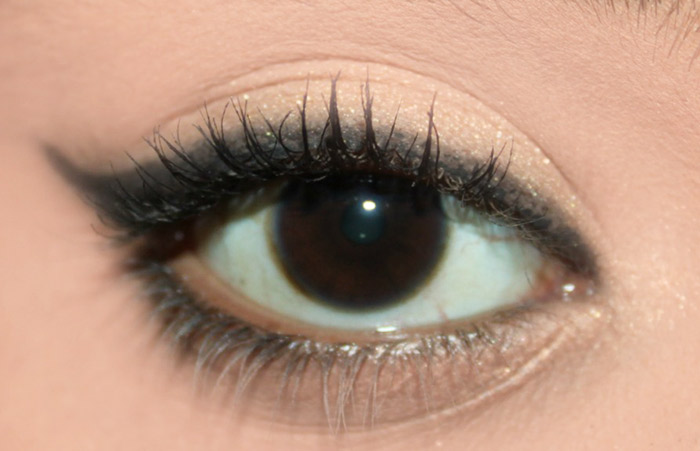 Now apply your favorite eyeshadowto the eyelid area of your eyes. Load the eyeshadowon a flat brush and softly pat the color over the moving eyelid area. I picked a gorgeous light champagne gold satiny eyeshadowcolor for this tutorial to clearly reflect the effect of the soft-winged eyeliner look. Now, take a black liquid eyelinerand you can do a dramatic winged eyelinerlook like you usually do — thick or thin, totally depending upon your preference. Now, wait a few seconds for the formula to set and completely dry. 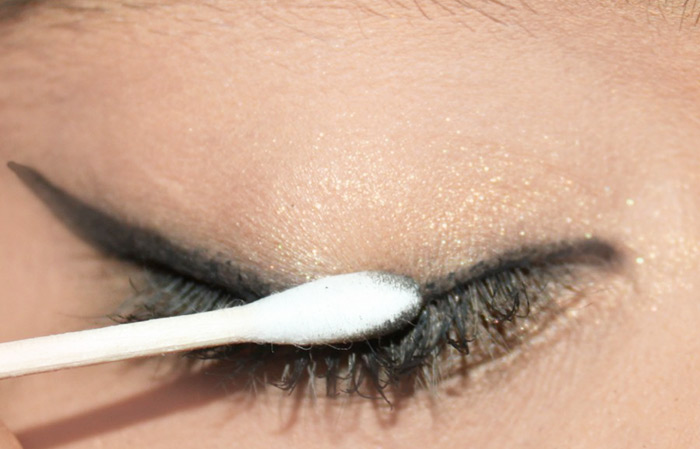 Then, take a clean cotton swab and gently run it along the outer edge of your winged eye liner. 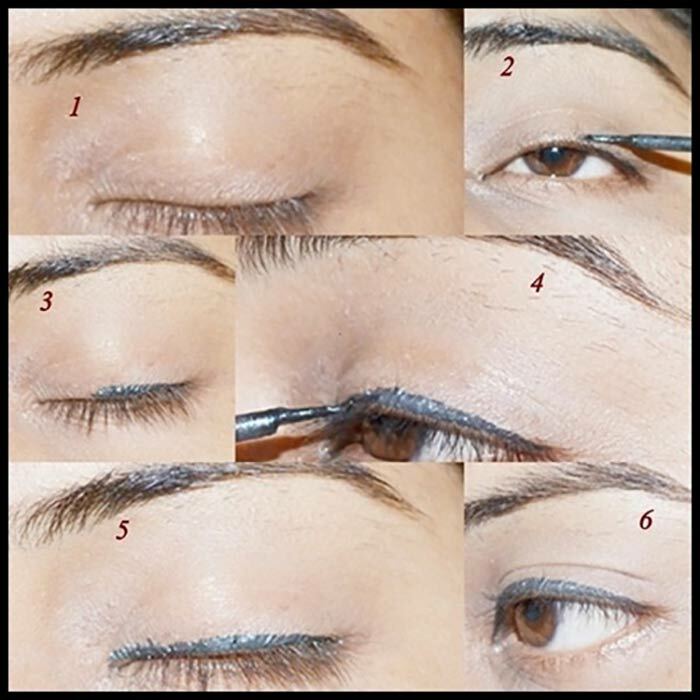 Swap the cotton bud along the outer edges only, and do not bring it near the upper lash line area. The idea behind this step is to soften the outer sharp edge of our winged eye liner, but you should also remember not to remove the pigmentation of the liquid eyeliner as it might make your eye makeup appear worn out and faded. Gently press and softly run to and fro motions on the outer edges of the winged eye liner. Remember not to pull the eyelinerover the upper lash line of the eyelid area as it will give a faded and messy appearance, which will not look good even for the casual everyday look. Now, take a matte black eyeshadowon a thin angled eyeshadowbrush and gently push it on your upper lash line, just above the winged eye liner. This step is optional, and if you are in a hurry, you can totally skip it. I recommend that to do, if you have a few extra minutes in hand as it will increase the longevity of your eye makeup and also reduce the sharp liquid eyelinerlook. And, you are done! There you have the soft, yet elongated winged eyelinerlook. Try it and let us know in the comments section below.